A completely redone setting system. It will no longer require you to edit the pytextedit_config.py file yourself, but will instead have a settings dialog in the main application. The configuration file will be converted to plain text, to make it easier to read/write. Also, settings will save across sessions. Fixed default directory on Windows. Currently trying to set it to the HOME variable doesn’t work on Windows. Instead, it will default to “C:”. Recently Opened will save across sessions, by storing the file paths in a text file. It may also be changed to use a menu instead of a separate window. Open File will close the file after it has been read from. Some minor UI changes to make it look better. Textbox_LN (the class used to implement line numbers) will be simplified. 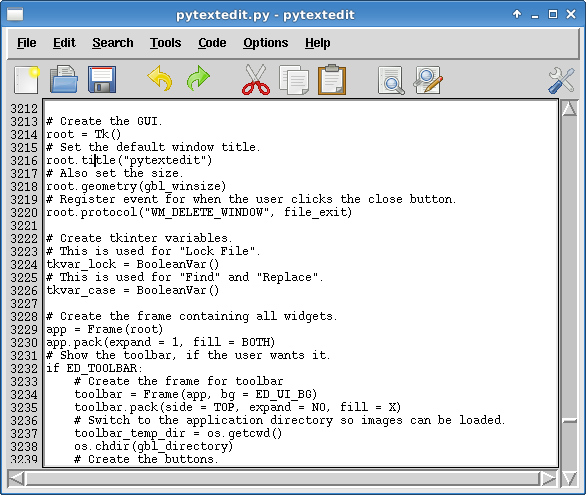 Currently it has unnecessary code that allows it to support more than one textbox. Considering I only need one, this is absolutely useless. It will be possible to disable line numbers. Help dialogs for toolbar buttons. I’m still trying to decide how to do this. Possibly have a right-click open the dialog? A new Quick Open command in the File menu for opening files without going through the entire open dialog. Font size will no longer be able to be under 1. Functions will be moved to a separate file in the resources directory called functions.py. This makes it easier to edit them, as I will no longer have to scroll all the time to switch between the functions and the code for the UI. Classes will be in their own file as well. Adding a README file. I honestly don’t know why I haven’t already done this. More added to the file types list? The View Options command in the Options menu will be gone, as it will be useless with the new dialog. Simplify some of the configuration. For example, get rid of ED_CMD_INIT_DIR and use ED_INIT_DIR for both the GUI and CLI. Spellchecker will be removed. It might be back in a later version, if I can improve it. As it is it really isn’t useful. Default font will be changed. Evidently “monospaced” isn’t a recognized value. “Courier” or “courier new” will probably be used instead, to remain as cross-platform as possible. Window size will be saved, and restored when the application is next opened. I’m still trying to figure out how to do this. Probably get the window size and position on exit (both through the Exit command or using WM_DELETE_WINDOW), save it to a file (“resources/lastsize”), and read the file on next open. Revised new file_exit() to quit without confirmation if file was saved. Added option to hide file label. Added submenu “Code -> Compile” with options to compile C and C++ code. Also added corrosponding options in config file. Tweaked keyboard shortcuts a little. Added a “Delete” command to “File” menu. Added a “Rename” command to “File” menu. Modified some window titles to be more consistent. Added button to “Recently Opened” dialog to clear list. Fixed a bug in “Rename” where it didn’t stop the function while not having a file open. Changed “Copy” to work while file is locked (why shouldn’t it?). Cut some unneccesary code from edit_line_cut(). Modified “Select All” to keep cursor at current position, instead of moving it to top. Removed some useless lines from the “Replace” functions. Removed some useless lines from lots of functions. Added improved “Font” options dialog, with entries for font name, font size, font style, foreground, and background. Added improved “Insert Tag” dialog. Updated and improved the “About” dialog. Commented the code to build the menus a little better. Changed the buttons in the “Exit” dialog to have a little padding. Changed the title in the dialog used by “Rename” to say “Rename”. Fixed bug where clicking “Cancel” in the “Rename” dialog would result in an error. Removed “Edit -> Lock File” submenu, and replaced it with a checkbutton. Fixed the problem (I wouldn’t even call it a bug) where changing the file to read/write mode would add an unnecessary “-” to the title when no file was open. Changed “style” entry in the “Font” options dialog to an OptionMenu, to limit the choices. 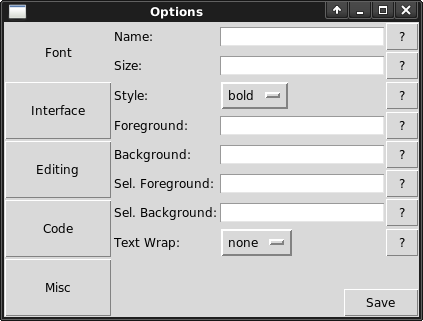 Further improved the “Font” options dialog by merging the “Wrap” options dialog with it. Added (yet another) new “Exit” dialog, this time using the tkinter Dialog from tkinter.dialog. Switched positions of “Copy” and “Cut” in the “Edit” menu. Added an option in the config file to show/hide toolbar. 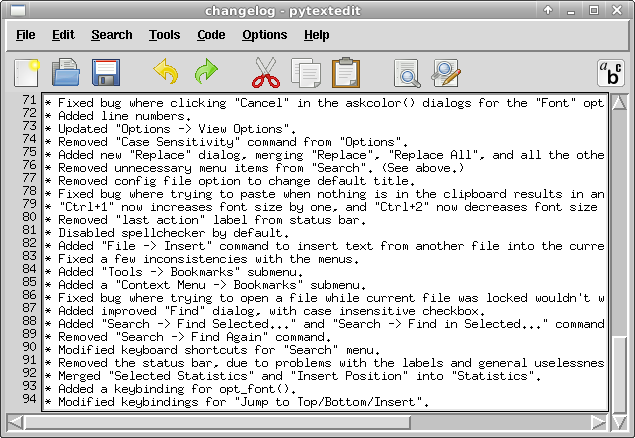 Fixed bug where clicking “Cancel” in the askcolor() dialogs for the “Font” options dialog would result in an error. Updated “Options -> View Options”. Removed “Case Sensitivity” command from “Options”. Added new “Replace” dialog, merging “Replace”, “Replace All”, and all the others into one dialog. Removed config file option to change default title. Fixed bug where trying to paste when nothing is in the clipboard results in an error. “Ctrl+1” now increases font size by one, and “Ctrl+2” now decreases font size by one. Removed “last action” label from status bar. Added “File -> Insert” command to insert text from another file into the current one. Fixed a few inconsistencies with the menus. Added “Tools -> Bookmarks” submenu. Added a “Context Menu -> Bookmarks” submenu. Fixed bug where trying to open a file while current file was locked wouldn’t work. Added improved “Find” dialog, with case insensitive checkbox. Added “Search -> Find Selected…” and “Search -> Find in Selected…” commands. Removed “Search -> Find Again” command. Modified keyboard shortcuts for “Search” menu. Removed the status bar, due to problems with the labels and general uselessness. Merged “Selected Statistics” and “Insert Position” into “Statistics”. Added a keybinding for opt_font(). Modified keybindings for “Jump to Top/Bottom/Insert”. Download here, if you want it. Version 0.1 final will have a lot of changes, so it might be a while.